Nathalie Olah reports on the frightening ‘killer robots’. Machines can find military information but they do not know what is right or wrong. 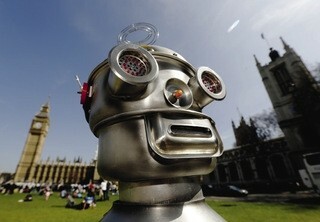 We may think that drones are bad but it is likely that we will think ‘killer robots’ are worse. They are different from remote-controlled drones. The ‘killer robots’ need no external ‘live’ human to control them. They can be pre-programmed to select and destroy specific targets. The new weapons are a serious problem for human rights, says the Campaign to Stop Killer Robots. They think that the arms are against international law because there is no human to blame. Just like drones, made in secret and used almost without warning in a war zone, killer robots could be used in combat without public debate. It’s a new problem that concerns human rights groups and military organizations. The military organizations think it is right that wars should be fought by trained individuals with certain rules. The US, Britain, Russia, China, and Israel are developing the ‘killer robot’ technology. Israel already has the ‘Harpy’ – a ‘fire and forget’ weapon which can find and destroy radar. Laura Boillot works for Article36, a not-for-profit organization which works to stop unacceptable harm caused by weapons. She says that we will start to see killer robots in battle. So when will governments discuss controls on killer robots? The UN Human Rights Council had its first debate on the rights and wrongs of these weapons in May 2013. Britain was against stopping the development of the arms. Britain was the only country out of 24 to be against stopping killer robots. Boillot says that one or two countries think the problem should be discussed at the next meeting of the Convention on Certain Conventional Weapons (CCW) in November 2013. She says that around 100 countries are part of the treaty, which banned blinding lasers. They are like killer robots because they were banned before they were used. The CCW stopped killer robots but the technology now exists. In the future, it will become more and more difficult to control.